Music and movement activities allow children to develop their physical skills, enable them to communicate through movement, and respond to the mood of art through music. 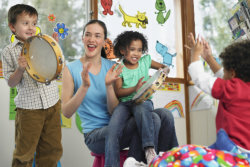 That is why we have activities such as singing and dancing at our Childcare Center in Irvine, California. This activity gives the children a creative experience where they learn about themselves, play music together, and socialize with other kids. Our music and movement activity is specially designed to train our students to develop their physical, social, emotional, mental, and creative skills.